Finding the perfect double dog solution is not easy. Whenever you try to walk more than one dog at a time, the leashes end up getting tangled up and tied in knots and what seemed so simple at first turns out to be an unanswerable problem. But not anymore! With the EzyDog Double Dog Leash Solution, you can walk two dogs at a time and have it be hassle free and tangle free. The best way to handle multiple pets is to get two Cujo Leash extensions. These 24 inch leash extensions are made with swiveling rings that keep the leashes tangle free. And the strong and durable material the leash is made with is up the challenge no matter how large your dogs are or how enthusiastically they pull at the lead. 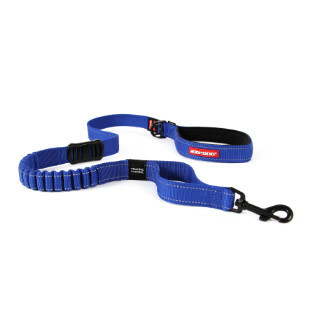 If you are walking smaller dogs, the Cujo 40 inch leash extensions are even better, because they allow more room and are made with a lightweight material. Trade in the stress of trying to keep multiple dogs in line and go for an easygoing stroll instead with the EzyDog Double Dog Leash Solution. The leash extensions are light and comfortable for your dogs. And the great, firm handle on the Cujo leashes gives you excellent control even when walking two dogs at once! If you prefer a soft, flexible handle, you can also use a Mutley leash, which provides just as secure a connection between you and your pets, but a lighter handle for you to carry. I have a 70 pound Pit Bull and and 60 pound husky. They are beautiful girls but they pull my arm off. 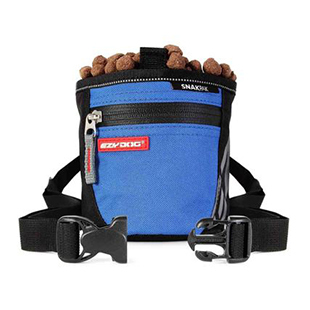 With this system, the Cujo leash and two extensions its a whole new walk! They don't pull, they have enough room to do their business and not get in each others way. The handle is extremely comfortable. I can walk them easily with one hand and keep the other free. I love walking them now and walk them every chance I get! My dogs are SOOO much easier to walk now. They like walking sidebyside but also have the ability to wander a few feet from one other. I like how they correct each other. So glad my friend recommended this to me. I got the 25-inch Mutley leash with the two 24-inch extensions to walk my two small dogs (11lbs and 15lbs). My smaller dog did not like being connected to the other dog who pulls (if one dog pulls to the side, it will pull the second dog) so I now only use the leash on the "puller" and it is great! The handle is super comfortable, even while the leash is being pulled. I love it. What a wonderful solution for walking both of our hounds together! The bungee is perfect for pullers and I especially love the soft handle. This lead is so versatile and comfortable. It is especially good for taking your two dogs together without tangles and the leash provides great support for those dogs who pull. On another note, we would purchase more of your products if you had a shop in Canada or the shipping was not so expensive. Many people have asked me about the extensions..
We did a 5k walk/run last weekend and I used my double dog solution on my dogs and it worked great! I really like the feel of the soft handle and the extensions do not get tangled no matter what the dogs do. The Mutley Double Dog Extension is a a very efficient way for me to walk my two dogs simultaneously without getting tangled up in them when they want to move in different directions. I can use one hand to hold them both, I attached a carabiner to the ring on the handle to clip my poop-bag dispenser and my house keys. The bungee shock-absorber action in the leash gives the tension in my arm a break when my puppy pulls. All in all, a well-made, useful, sturdy, easy-to-use leash set-up. People often ask me about it when they see me using it with my black lab and pinscher and I highly recommend it. This is my favorite leash! This is my second EZY Dog leash and remains my favorite. The only leash I will ever purchase! I have a Miniature Pinscher and an Australian Silky and the double dog solution allows them to walk as a team. The handle is so comfortable and the leash is indestructible! By far the best leash I have ever used! I have 2 Cairn Terriers who love to pull when we are approaching the dog park. With the double dog leash I have full control and I prevent my hands from straining and also from hurting themselves.